There was a battle waged in my kitchen this weekend, me v. gooseberry pie. I was knocked out in round one but recovered and ultimately won the match. And in the end, the pie was delicious. The tartness of the gooseberries played well against the flakiness of the crust. 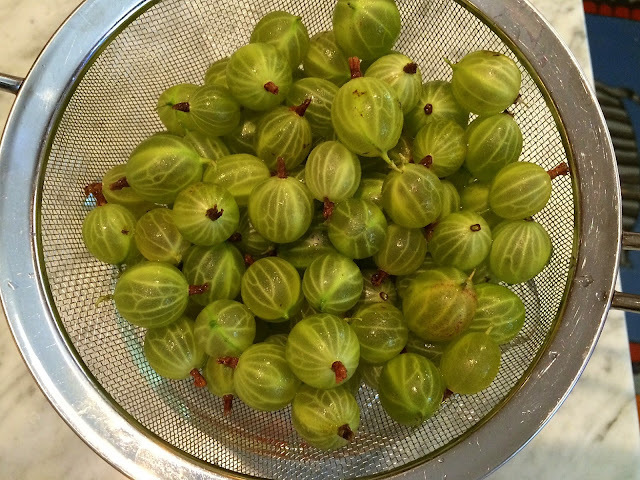 Gooseberries, a tart berry which can be cooked or eaten out of hand, appear for just a week or two at our local farmer's market. I've observed them for years; on Saturday, I decided to take the plunge after discovering a couple of vintage gooseberry pie recipes in my collection. The gooseberry war involved the thickener (and the lack of clear instructions, typical of the vintage recipe cards I bake from). The agony of defeat (and triumph of victory) are detailed in some photos below. To make it right, begin by giving the berries a rinse under cold water. Next, they need trimming. There's the stem and also the brownish thing (that's the technical term) on the opposite side. I discovered that a very clean nail clipper makes quick work of this task. My recipe called for tapioca as the thickening agent. I originally used the small pearl tapioca (right). That was a huge mistake. 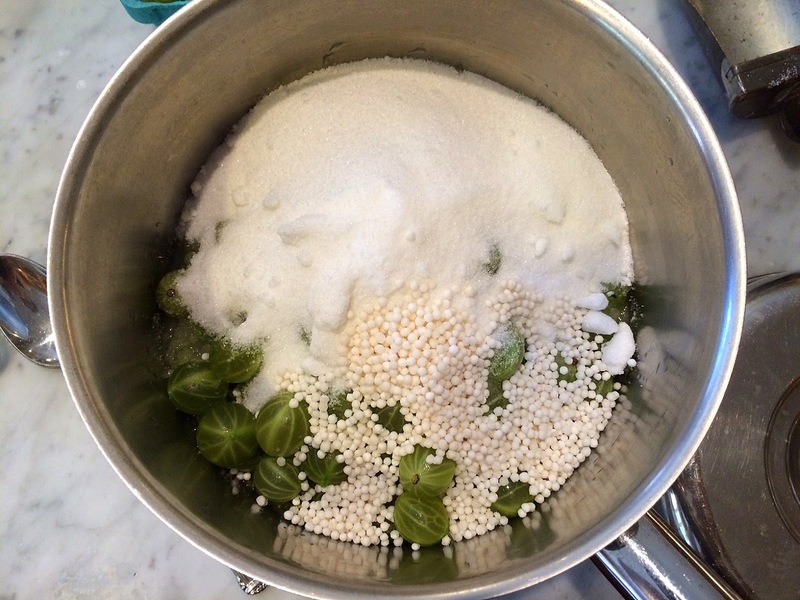 Filling ingredients with small pearl tapioca. You can see below that the pearls did not dissolve. I also probably way overcooked the filling -- the instructions said to cook until thick, but it never really got thick. I tossed out the entire batch. 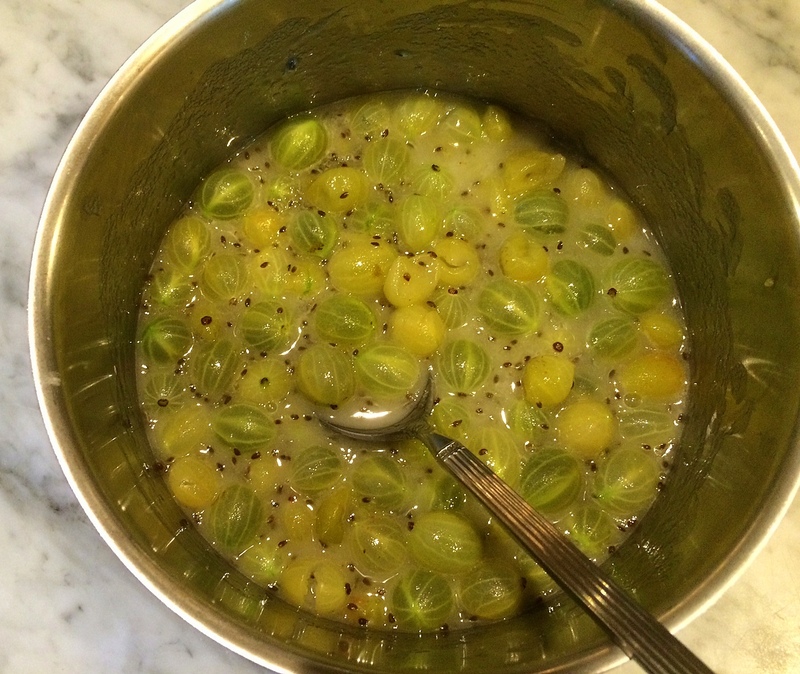 Luckily, I had miscalculated the amount of gooseberries I needed, and had an extra three cups for round two. 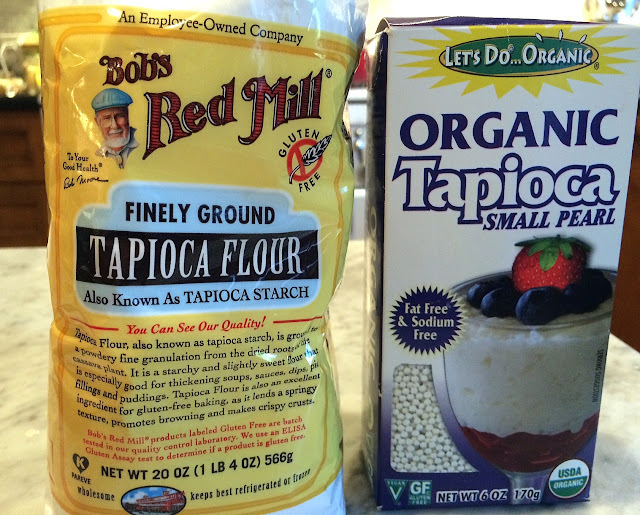 After a quick trip to the corner store, I used my new purchase: tapioca starch. 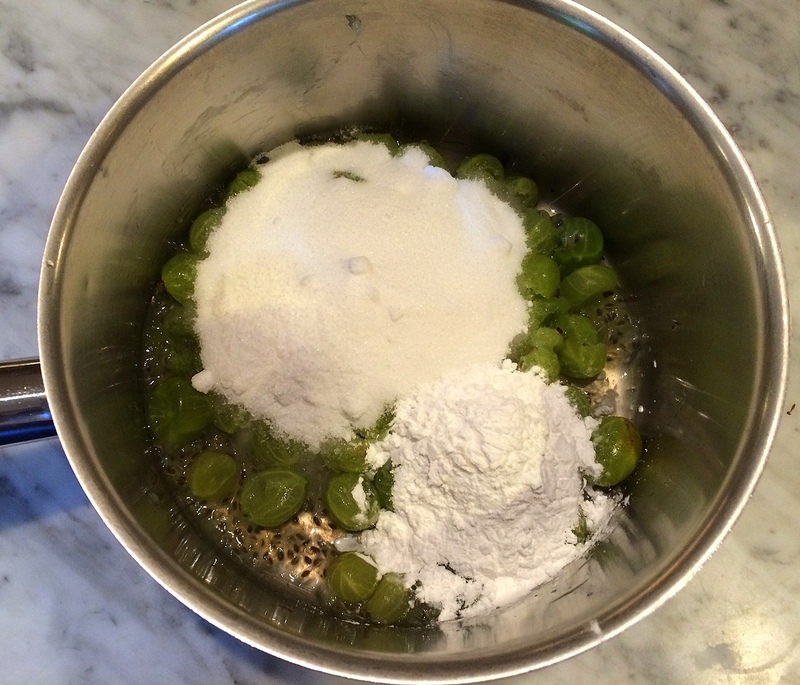 I could have made my own by whirling the pearls in a food processor (I realized too late). Perfect! I didn't cook it very long, just to the boil. 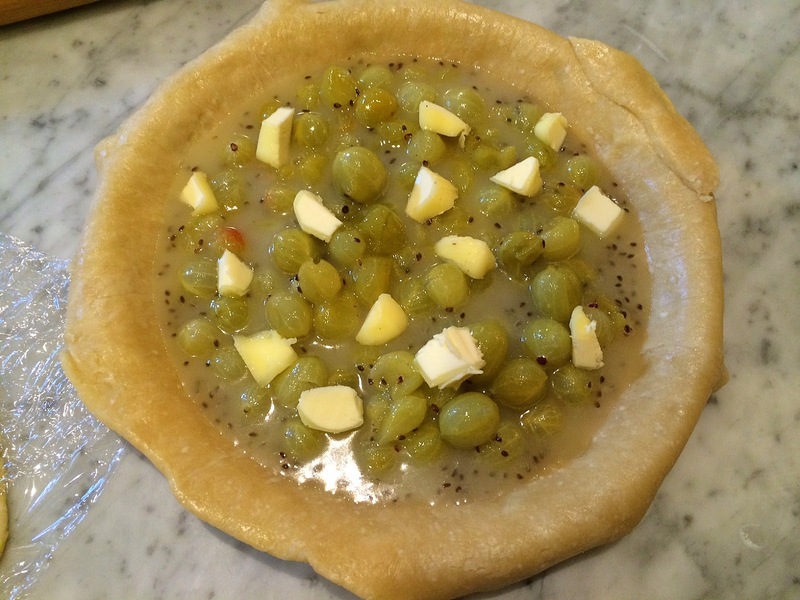 Fill an unbaked pie crust with the gooseberry mixture and dot with butter. 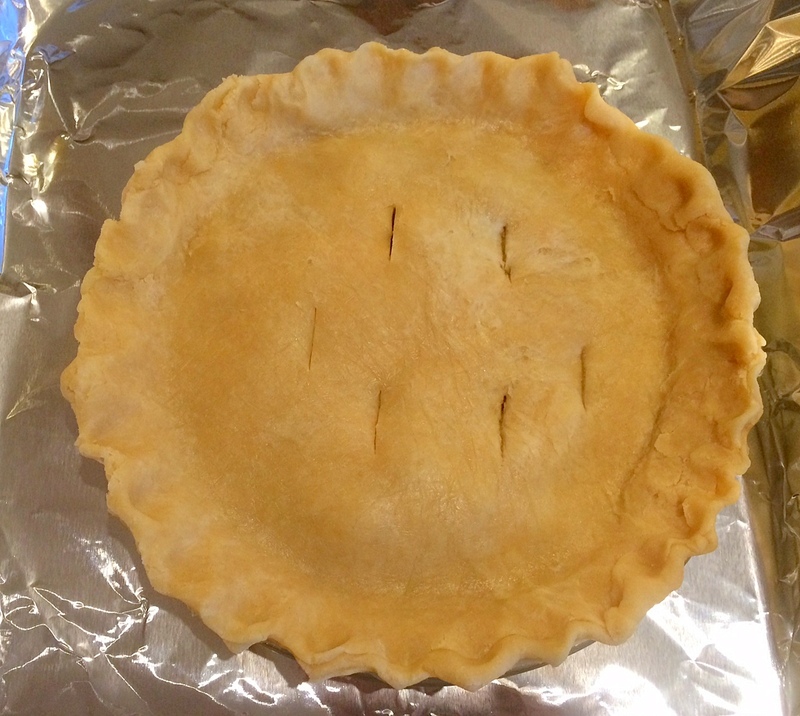 Cover with the top crust, cinch the edges and vent by making a few small slits with a knife. 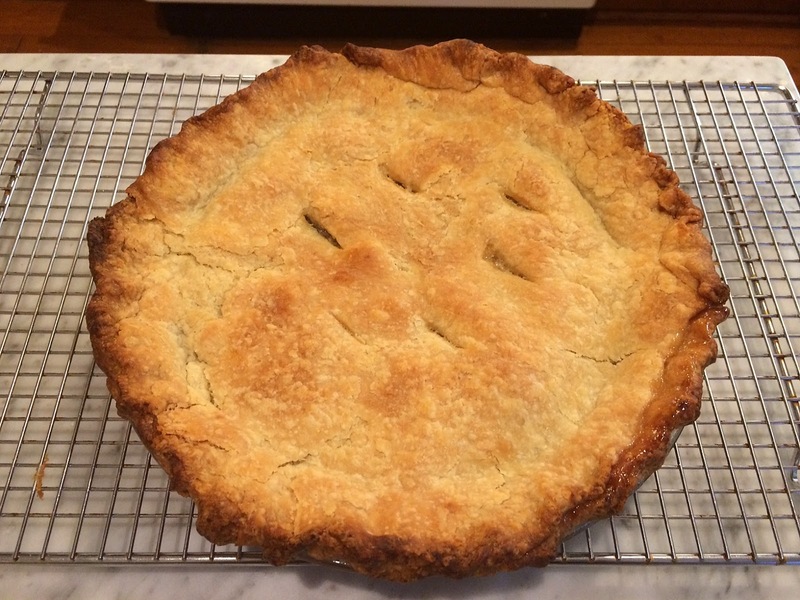 Always, always, bake pies on a foil covered cookie sheet. This not only prevents the filling from overflowing onto the oven floor, but makes taking the hot pie from the oven much easier. 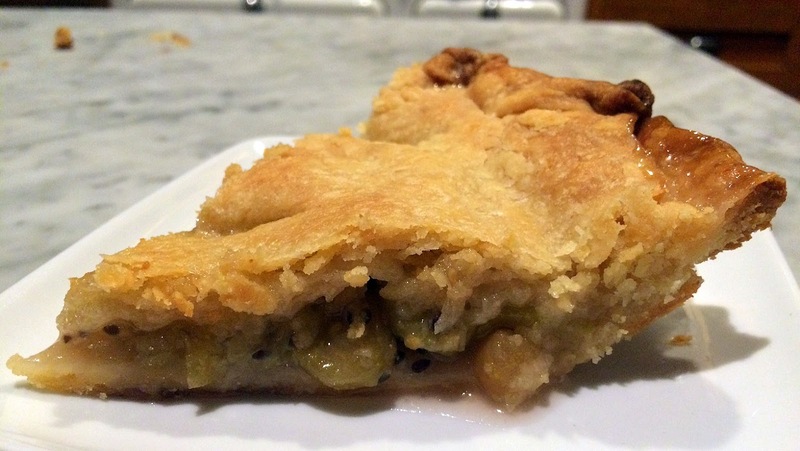 Refrigerating the pie for an hour or so before baking will help the crust edge retain its shape. The edges of the crust got a little too brown, even though I covered them with foil near the end. Since the DH and I couldn't eat an entire pie, I shared some with our neighbors, (a British-American couple) who have two teenage sons. 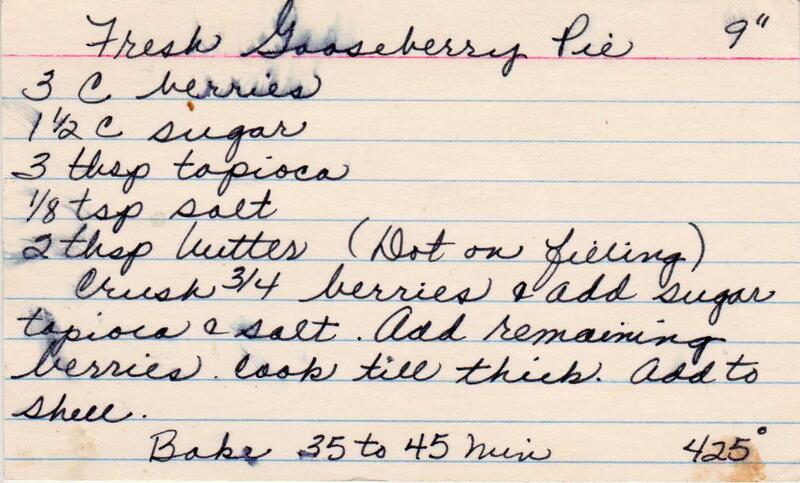 The next day, my native London neighbor told me that his mother used to make gooseberry tarts. 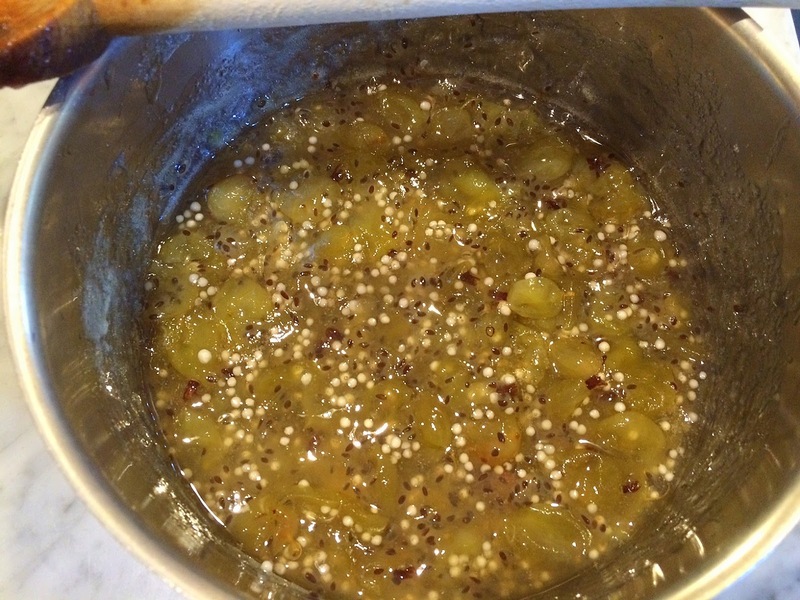 Production notes: Trim both ends of the gooseberries.Use either minute tapioca or tapioca starch for the best results. Cook the filling just until it comes to the boil. Let cool before filling the pie shell. Modern day tastes may like more filling, so feel free to increase the amount of gooseberries (and sugar, tapioca, etc., proportionally). Pie crust recipe follows. 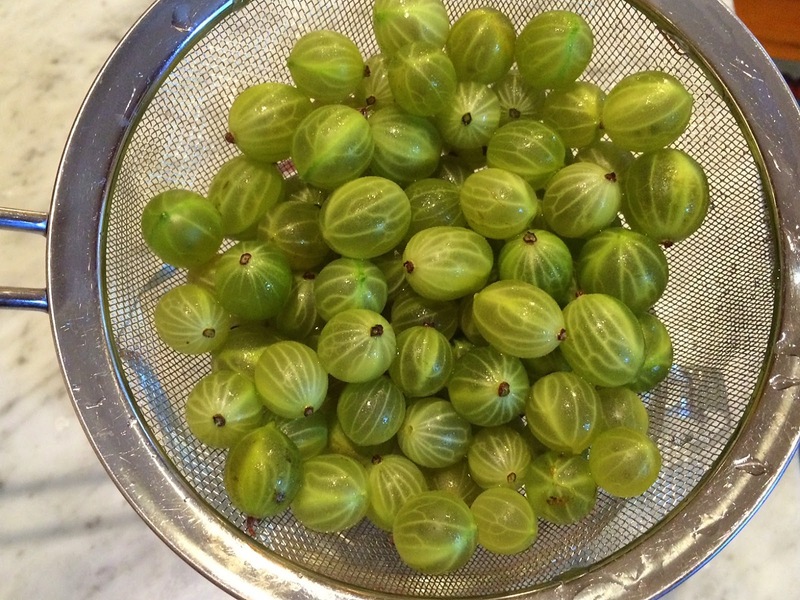 We planted a Gooseberry bush this year, so this was a fun recipe to find. thanks. Gooseberries reminds me of my childhood in Germany, I enjoyed picking them.